Elitegroup Computer Systems (ECS) is a renowned Taiwan-based electronics firm, better known as the fifth largest PC motherboard manufacturer in the world. 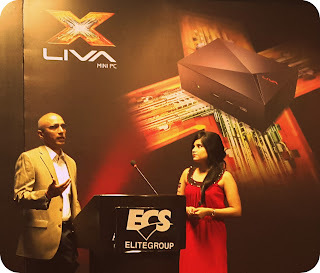 Last week I received an invite from them to attend the exclusive launch of their latest mini PC in India called the LIVA X. 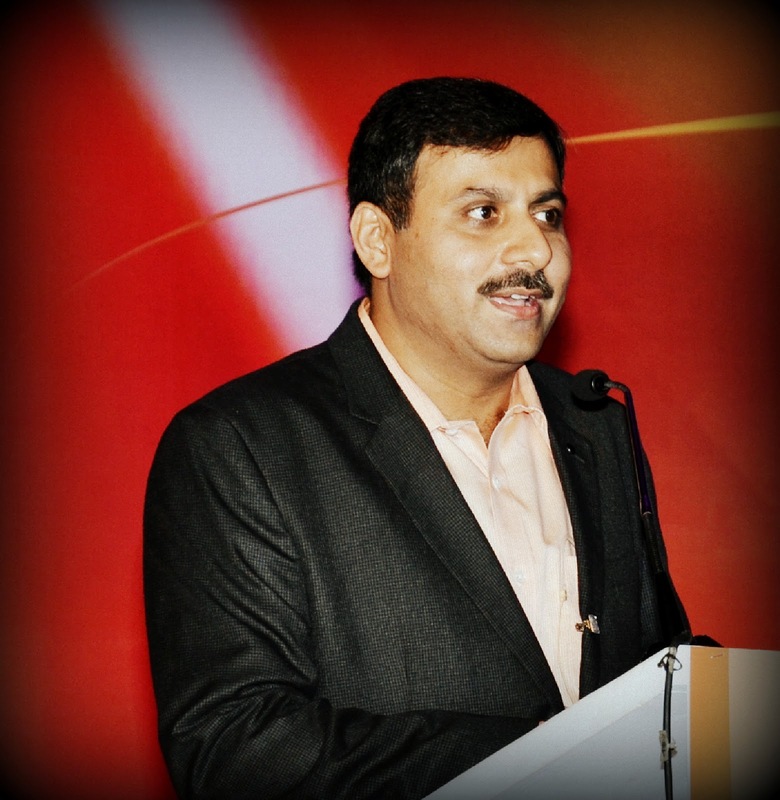 The event was held at the Le Meridien Hotel Delhi on Tuesday, April 28, 2015. And yours truly was there to catch all the action firsthand. 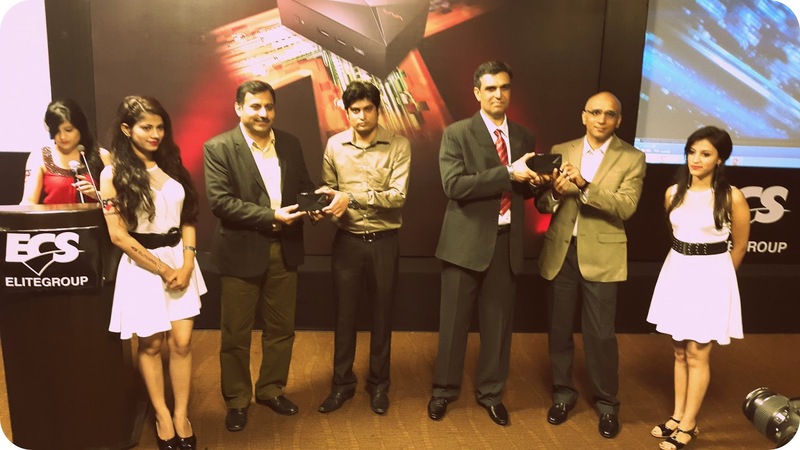 The guest list comprised of eminent representatives from ECS, Rashi Peripherals, Intel, Amazon, and Flipkart. The event started with emcee, Parul Dhawan, welcoming guests and then asking attendees to observe a 1-minute silence in the memory of Nepal earthquake victims. Even though Sunny Yang, ECS General Manager, could not be physically present for the event, he delivered an AV message for all attendees. 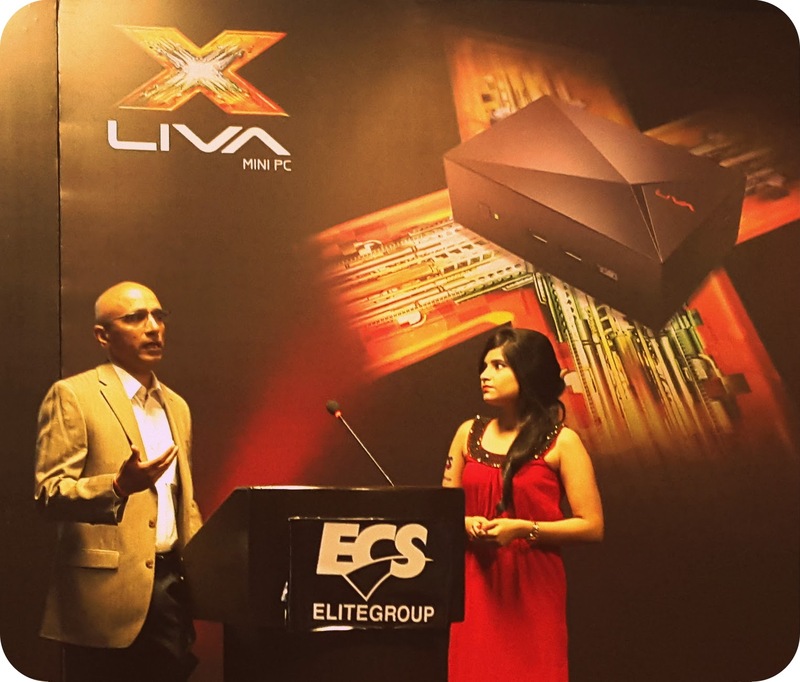 Similarly, Ken Chen from ECS, who spent the past 9 years in India and is responsible for the ECS growth in this region, delivered another AV message to congratulate everyone on the successful launch of LIVA X.
Rashi Peripherals is the golden distributor of LIVA X. 20 years ago, the size of a PC resembled the size of a room. Today, a PC can weigh anywhere from 8 to 10 kgs. LIVA X is small enough to fit in the palm of your hand. The size has reduced to 1/10th of a traditional PC. Minimum power required for a regular desktop PC to work is 150W. However, for the same performance, LIVA X just requires 15W. That's again a 1/10th reduction in power consumption. Intel and ECS have a 20-year-old partnership (related to motherboards mainly). No one likes a Desktop PC cluttered with wires or a noisy fan with accumulated dust. 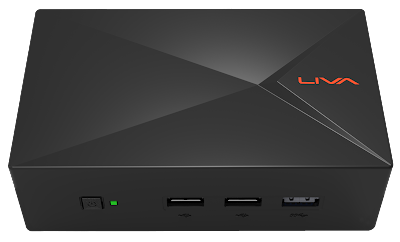 Mini PC like the LIVA X is a potential game changer, since it gets away from the clumsy wires, fan, or noise. 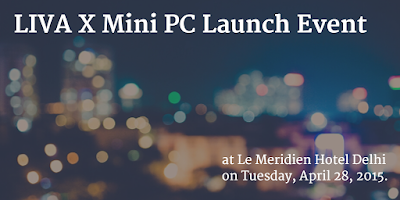 Mini PC is not a compromised PC. 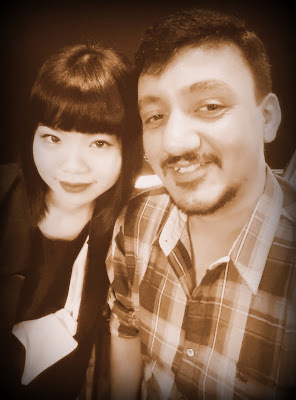 Most common misconception in India is that anything that is BIG will be BETTER. 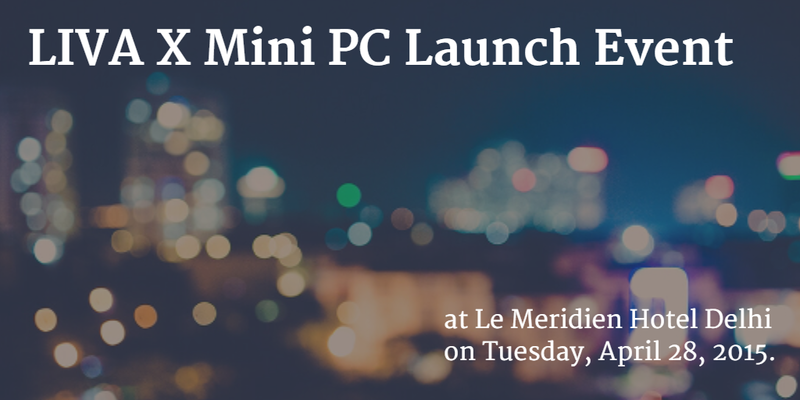 The mini PC market is the fastest growing segment in the Desktop PCs category. No fan is used in LIVA X design, so no noise. 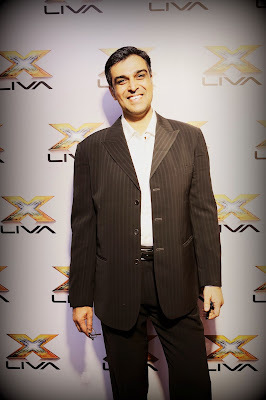 The thing I love the most about the LIVA X is its superior design. Measuring a mere 135 * 83 * 40 mm in size, the device is even smaller than your favorite 5-inch smartphone. Kudos to ECS for focusing on the form factor and making the device fit into your pocket with ease. But that's not the only thing you're going to love about its design. 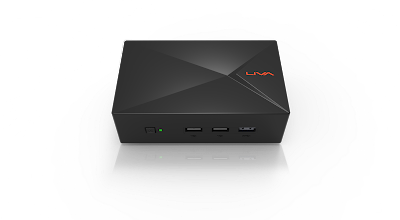 The LIVA X is essentially a ultra-low power consumption, fan-less device. What that means is you're saved from major PC issues like excessive loud noise that results due to accumulated dust in your CPU fan or power supply fan. When you kill the fan, you also kill the noise. LIVA X delivers zero decibel noise to render a better acoustic performance and extend the lifespan of your device. When it comes to performance, the small-sized LIVA X leverages the power of advanced 22nm technology to deliver best in class performance via its CPU and chipset. It adopts the new Intel multicore System-on-a-Chip (SoC), which hails from Intel's powerful processor family for desktop devices. The 64-bit 2.25 GHz dual core processor in LIVA X offers smooth full HD and 4k video playback. Laptops are designed to consume less energy. On the other hand, PCs are power hungry devices that pack more hardware than you can imagine. 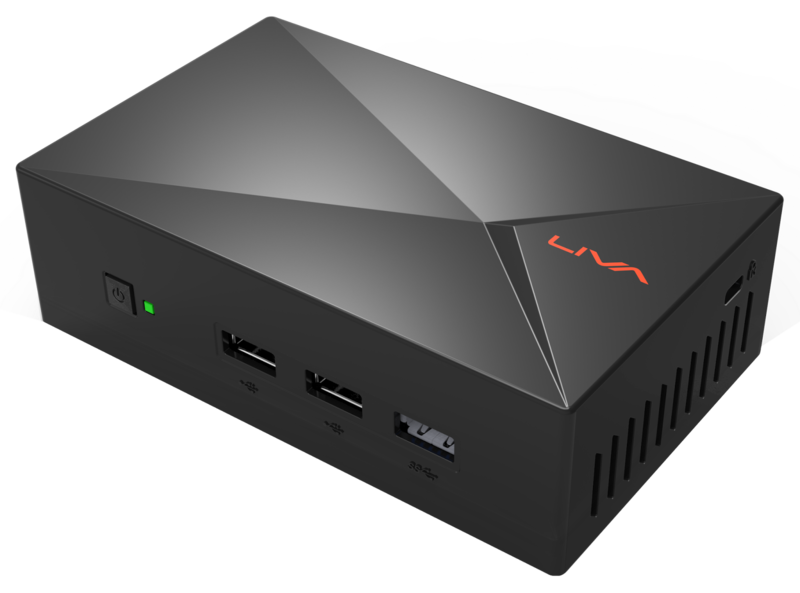 Not the case with LIVA X though, which is exclusively designed for ultra-low power consumption (15W only). The device contains a low voltage DRAM (DDR3L) that only consumes 1/5th of power when compared to traditional PCs. Imagine the amount of money you are about to save! 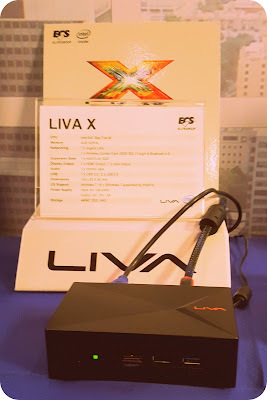 LIVA X is packed with a Wireless Combo Card that supports both Wi-Fi and Bluetooth transmissions. It also supports mSATA SSD for better storage and fast data transmission. To stay ahead of future, LIVA X is fueled with 4G DDR3L DRAM, which essentially is memory that operates on low voltages. Lower voltages translate into less heat, which ultimately increases the life of your device. 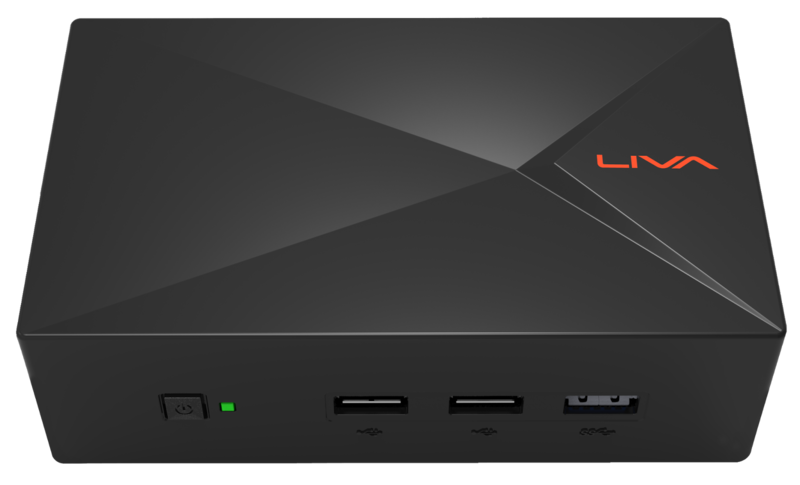 Another attraction in the LIVA X is the support for SuperSpeed USB 3.0 that allows data transfer at up to 5 Gbit/s (625 MB/s). That's ten times faster than USB 2.0. If you're wondering what keeps the LIVA X palm-sized, credit goes to the ultra-thin eMMC memory that frees up space for other components and is even smaller than your local postage stamp. 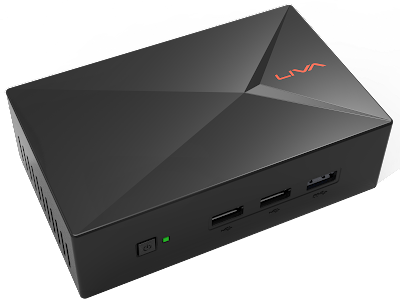 LIVA X supports both Windows 8.1 and Windows 7 to provide the latest and the most popular user experiences, respectively, via the mSATA SSD. Won't it be great if your device was able to support both digital and analog displays? By supporting HDMI and D-Sub, LIVA X not only fulfills your desire to have two independent output displays but also offers a wide choice of home entertainment or multi-display applications. The pricing of LIVA X is competitive to say the least. With the help of the native VESA mount, you'll easily be able to place LIVA X behind any display, monitor, or TV. You'll not only save space but also create a cable-free environment in the process. Let's be honest here. The future of full-grown PCs seem uncertain, owing to growing popularity of the mobile devices like smartphones and tablets. But this mini PC might just be the ultimate disruptive device the industry had long been waiting for.